Match officials considered stopping Arbroath v Montrose after flying device spotted. A football match almost had to be stopped after a drone was flown over the pitch. Match officials considered suspending play in the SPFL League One fixture between Arbroath and Montrose on Saturday. The flying device was spotted hovering above the pitch at Gayfield Park, Arbroath. Police managed to find the pilot, who has now been reported to the Procurator Fiscal. Angus local area commander Chief Inspector David McIntosh said: "Flying drones without the appropriate training, experience or licence can be hazardous, no more so than over a crowded area such as a football match or concert. "A loss of power or signal to the drone can have a significant impact and cause injuries to others. "Drones that are used at events have the appropriate license and are used in the full knowledge of the organiser and events planning team to ensure the safety of others. "Any person using a drone irresponsibly could be arrested, but will certainly have the drone confiscated and the circumstances will be reported to the Procurator Fiscal. "If you have a drone, or are planning to buy or use one, please make yourself familiar with the appropriate legislation, and use the equipment safely and sensibly." 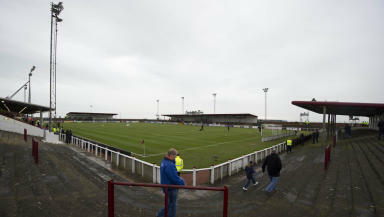 Arbroath won the fixture 2-0 to move ten points clear at the top of League One.